New damage in Eastern Aleppo since the collapse of the ceasefire. Source: UN. 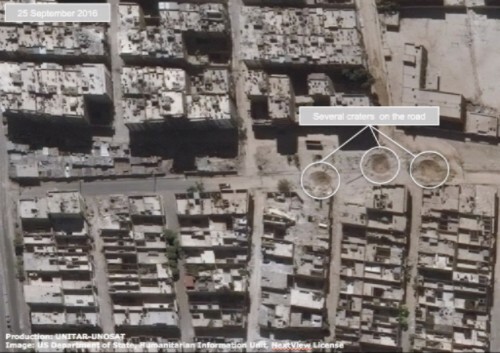 The UN released new aerial photographs of Aleppo, showing damage to the city, on October 5. See the AP article at the News Sentinel here or Washington Post here. Association for the Protection of Syrian Archaeology have released a report on the damage to Mosque el-Touba here and here. A traditional house was severely damaged by fire in Sarouja, just outside Damascus, on October 4. See more information and photos here. Now.Media reports on the status of Bab Touma Christian quarter, part of the World Heritage Ancient City of Damascus here. ASOR’s Cultural Heritage Initiatives released its weekly report 107/8 (August 19-31, 2016). Recent video footage and eyewitness accounts detailed damage to three churches located in Sinjar, Ninawa Governorate (ASOR CHI Incident Report IHI 16-0028). Peshmerga forces discovered that ISIL militants dug tunnels and installed showers in a mosque in Abzakh, Ninawa Governorate (ASOR CHI Incident Report IHI 16-0029). New video footage shows extensive damage to a cemetery in Arbin, Rif Dimashq Governorate, reportedly the result of SARG airstrikes (ASOR CHI Incident Report SHI 16-0132). An alleged SARG airstrike damaged a mosque in Khan al-Shieh, Rif Dimashq Governorate (ASOR CHI Incident Report SHI 16-0133). Allegedly, a SARG barrel bomb and Russian cluster bomb damaged a mosque and religious school in Aleppo (ASOR CHI Incident Report SHI 16-0134). The DGAM published photographs of extensive damage to two historic buildings in Aleppo (ASOR CHI Incident Report SHI 16-0135). New video footage shows damage to a mosque in Damascus, reportedly the result of ongoing SARG military activity in the area (ASOR CHI Incident Report SHI 16-0136). ISIL militants vandalized the exterior of a mosque in Djerablus, Aleppo Governorate (ASOR CHI Incident Report SHI 16-0137). Quoting the Association for the Protection of Syrian Archaeology (APSA), The Telegraph states on October 3 that Palmyra continues to be plundered, even though it is protected by Russian and Syrian forces. See report here. Ahrar al-Sham have apparently discovered stolen antiquities after raiding a Jund al-Aqsa base in Idlib countryside, here. The DGAM sent 8 of its personnel to the current course organised by ICCROM-ATHAR in in Sharjah (see below under International Activity). See reports here and here. For a week, UNESCO and the German Archaeological Institute (DAI) trained Syrian experts on best practices for safeguarding and digitising manuscripts, historic document and archives here. According to SANA, the Syrian Minister for Culture met with the Czech Deputy Minister of Foreign Affairs to discuss cultural cooperation, in particular means of preserving ruins and heritage. Talks during the meeting concentrated on the way through which the Czech side can help Syria rehabilitate and restore what has been destroyed of antiquities at the hands of armed terrorist groups. The DGAM have also reported on this. Syrian and Iraqi refugees, trained as guides, lead visitors through museum galleries in Berlin. See the article from the Art Newspaper here. 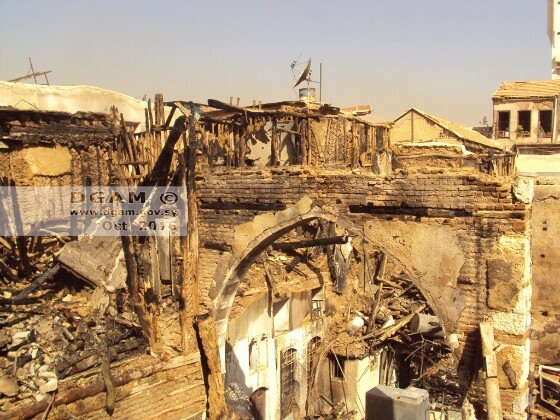 The new report from the OHCHR calls intentional heritage destruction a war crime and a violation of human rights here. The nine year sentence for Ahmad al-Faqi al-Mahdi in the International Criminal Court for the destruction of shrines in Mali is hoped to stand as a deterrent to attacks on heritage sites elsewhere. See the report from the Guardian here. In two excellent articles, see further reflection from the Art Newspaper here and the Economist here. The ICCROM-ATHAR centre at Sharjah is conducting training on protecting cultural heritage in war zones. See further information here. The Russians will send an archaeological delegation to Syria later this year to examine damage to sites in northern Syria. See more information here. The new report from the UNODC/UNESCO/INTERPOL initiative “Protecting Cultural Heritage – An Imperative for Humanity” calls for better efforts to combat terrorists and looters, with a number of recommendations. See the brief here. See also comments of Ban Ki-Moon here. UNDP personnel have cleared rubble and conducted restoration work at the old souk in Homs here. Replicas of Syrian and Iraq archaeological artefacts destroyed by ISIS have been installed in Rome. See the New York Times report here. It has been widely reported that the French President Hollande announced a $100 million cultural protection fund. It should be noted that according to his original speech (here) this fund is aspirational. Australian stencil artist Luke Cornish travelled from his country to Syria to see with his own eyes what is happening. He painted a portrait of Khaled al-Asaad in the Amphitheater where he was executed. Cornish added “I wanted to paint this portrait of Khaled al-Asaad to pay homage to his sacrifice, a symbolic gesture of returning his head to the place that it was taken away, a place he dedicated his life, and ultimately sacrificed it, to protect.” He also paid tribute to the kind and hopeful spirit of the Syrians he met there. Read the full article in SANA here. A Japanese researcher has built a 3D model of the Temple of Baal at Palmyra which he hopes can be used for reconstruction, here. A database of mosaics, a legacy of work conducted by the European Center of Byzantine and Post-Byzantine Monuments in Thessaloniki, now forms a precious cultural resource here. In the latest edition of Tvergastein, The Interdisciplinary Journal of the Environment, the “urbicide” of Aleppo is examined here. The Gulf Daily News publishes a series of then-and-now pictures of Aleppo here. Forbes opinion piece asks, “Is 3D printing the heritage of Syria ethical?” here. The Conversation looks at the utility of tourist photos in preserving images of destroyed sites here. UNESCO highlights the importance of signing and ratifying its 6 culture conventions here. Diana Darke reviews a series of new books about Syria for the Times Literary Supplement, recommending in particular those focusing not only on Syria’s past, but on its present.